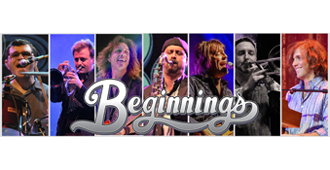 Beginnings – the Ultimate Chicago Tribute Band – is tightly woven structure of intellectual musical talent rarely seen in today’s music world, either in the original or tribute arenas. They are individually talented musicians who together comprise an ever evolving universe of musicality that encompasses multi-instrumentalists and multiple lead vocalists. Quite simply, they are a band like no other. This depth of talent is focused on the band Chicago, whose song book spans more than forty years, and includes five number 1 albums and twenty top ten hits. Quite simply, Beginnings is a band like no other. Beginnings’ performances bring to life the music of Chicago, and exceptionally recreate every decade of the band’s hits. Beginnings is a family friendly melodic adventure, pleasing to music lovers of all ages. Beginnings’ performances bring to life the music of Chicago, and exceptionally recreate every decade of the band’s hits. For years Beginnings has entertained audiences all over the country. Their performances include Walt Disney’s Epcot center, Bally’s Atlantic city resort casino, the m resort spa casino in Las Vegas, NV, The Golden Nugget Atlantic City Resort And Casino, The Wolf Den At Mohegan Sun Resort And Casino, Caesar’s Poconos Resorts, Hollywood Casino At Penn National Raceway, The Savannah Center The Villages, Fl, Circle Square Pac Ocala Fl., The Company Theatre (Norwell, Ma.) And many, many more. Beginnings invites you to make time to come out and hear the band. They know it will be one of the most enjoyable and entertaining shows you will ever see. The music of Chicago is truly wonderful – timeless classics that define generations – especially when performed by this talented group of musicians and the Ultimate Chicago Tribute Band – Beginnings. Meet the Band Members of Beginnings – The Ultimate Chicago Tribute Band. Mason Swearingen is a professional musician from Hendersonville, NC, who now resides in Kew Gardens, NY. He is the lead singer, bass player and front man for the much heralded CHICAGO tribute band, Beginnings. Mason studied with renowned voice teachers Marty and Don Lawrence in New York City, and as a member of the Eric Stuart Band worked with such names as Peter Frampton & John Regan and spent years touring in support of Peter Frampton, John Entwistle, Joe Walsh, Dave Mason and many more, including a few shows with CHICAGO themselves. He is a dynamic performer who engages the audience and his personality shines as bright as his smile during performances. Johnny Roggio is a professional guitarist, singer and recording artist from Secaucus, NJ. He has been performing onstage for most of his life, touring both nationally and internationally with numerous highly acclaimed original artists and tribute bands. As the lead guitarist for Beginnings, he mesmerizes fans with his guitar skills, infectious smile and energetic style… It’s the perfect formula for a show stopping performance. It’s those masterful performances that landed him the role as one of the guitarists in the Broadway hit musical Rock of Ages! Scott is a top-class pianist and keyboardist. He is a professional session musician, songwriter, producer and founding member of the NYC instrumental jazz/funk band ulu. Scott has also written and produced his own critically acclaimed original albums and is a full-time member of the world famous Pink Floyd tribute band The Machine. Hailing from the Bronx, NY, Chris is a professional drummer, vocalist, multi-instrumentalist, as well as a music educator. He is the owner of a private music school in Brewster, NY, and also writes, records, and produces original music for his company, “Funk Factor Music”. During his career, Chris has performed internationally in support of such artists as Stone Temple Pilots, The B52’s, KC and the Sunshine Band and The Brian Setzer Orchestra just to name a few. His recorded work has appeared on “The Late, Late Show” on CBS and the nation’s airwaves. Professional trumpeter, Doug Woolverton, has been cultivating his smooth, soulful, yet energetic trumpet sound for audiences around the world becoming one of the most in demand, versatile trumpeters of his generation. His sound, style, and beautiful tone have led Doug to his full-time career performing over 280 shows around the world each year. He’s in high demand! He has performed/recorded with: Aretha Franklin, Warren Haynes, Gov’t Mule, John Scofield, Roomful of Blues, They Might Be Giants, The Temptations, Little Anthony and the Imperials, Jerry Jemmott, Bernard Purdie, Delbert McClinton, Victor Wainwright, Shemekia Copeland, Samantha Fish, James Cotton, Tab Benoit, J. Geils, Johnny Vidacovich, John Herrington, Duke Robillard and many others. Check out Doug’s web site for more info, www.dougwoolverton.com. Dan Hendrix is a professional musician, arranger and producer from Agawam, MA. He received his degree in studio music and jazz performance from the University of Miami, with a focus on arranging, production, and music business. He has performed with artists such as Aretha Franklin, Johnny Mathis, The Four Tops, The Temptations, and the Glenn Miller Orchestra, while also performing with many of the country’s finest tribute acts and big bands. He currently owns and operates a music entertainment company as well as a recording studio where he also teaches. Dan brings a great energy to Beginnings and works diligently to pay tribute to the music of CHICAGO and the playing of one of the finest trombone players in the music business, Mr. James Pankow!